Restore snapshots into your live project - no cluttering up of your Recent File List! Browse and restore auto-saves too! 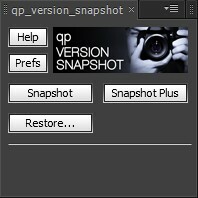 A "version snapshot" is just a timestamped copy of your After Effects project (similar to the way AE makes auto-save files) stored in a subfolder within your project folder. Think of a snapshot as a minor version update of your AE project, with Increment and Save reserved for major version updates, for example after rendering a movie for approval. 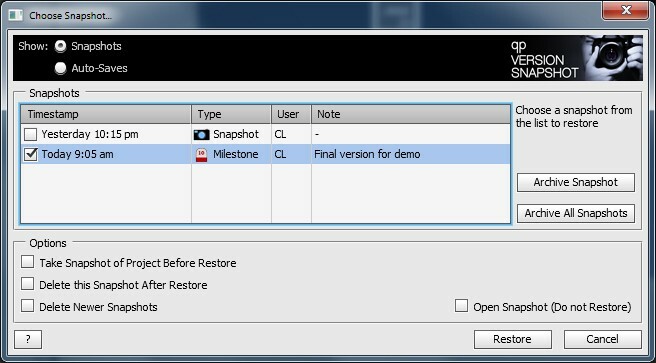 It is possible to archive old or unwanted snapshots from the restore dialog (this is the default behavior, which can be changed to permanently delete in the preferences). Archived snapshots can be copied back into the snapshot folder using Windows Explorer or Finder if you change your mind later. This script works with all versions of After Effects from CS3 upwards, however I recommend using it with CS4 and above; due to differences in the scripting language introduced in CS4 the Info Card will not work in CS3, and the restore dialog displays information slightly differently.